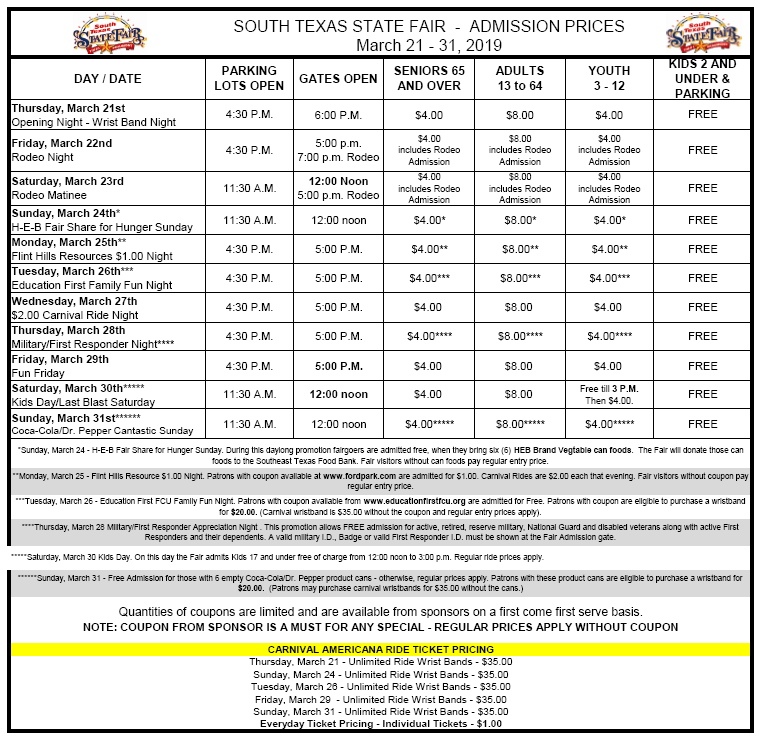 The YMBL South Texas State Fair & Rodeo brings thousands of visitors to Beaumont each spring with food, entertainment, and, of course, carnival rides. The Professional Rodeo Cowboys Association (PRCA) showcases the country&apos;s top cowboys and cowgirls at the YMBL Championship Rodeo while locals present their masterpieces at the School Art, Quilt and Photo Show. There&apos;s a Livestock & Poultry Show as well as a Youth Animal Auction, Kids Fun Zone and more. Held annually at the Ford Park Entertainment Complex, the fairgrounds are filled to near capacity with over 250 booths dishing out exotic and intriguing dishes made for easy eating on the go - funnel cakes, cheesecake-on-a-stick, pork-kabobs, rabbit-on-a-stick, fried alligator, fried pickles and more. Click here for a printable Daily Ticket Price Schedule. A fairgrounds map along with a complete schedule of events, including discounted admission days, is available on the YMBL website. The Fair offers regular deals and discount days as well as unlimited ride wristbands. View the price list and & buy tickets on the YMBL website.